Dance is serious. It’s years of training. Eons of dedication. No way is it a funny, knee-slapper art form. That’s a misconception choreographer Bekki Price will stamp out in “The Arc Between,” Ethington Dance Ensemble’s winter dance concert at 7:30 p.m. Friday and Saturday at GCU’s Ethington Theatre. “The audience doesn’t often think of dance as being funny, but we like to invite humor into dance,” Price said Tuesday afternoon from the theater, where the dance department was gathered for tech week rehearsals. Dancers perform at Ethington Theatre in the 2016 winter dance concert. It’s why Price has dived into a competitive swimming theme for the piece she choreographed in collaboration with students called “Qualifier.” It’s one of 11 works to be showcased at the concert – nine choreographed by faculty and two by guest artists. “It’s a quirky piece. … What we did was explore swimmers where you see upper-body movements,” Price said, adding how the dancers in the work are exploring the idea that a swimmer is limited to his or her lane. With that in mind, the dancers turn the cozy Ethington stage into a swimming pool of sorts with all its designated lanes. Dancers will be stretching out and exploring their “inner Michael Phelps” for the piece. Price said she doesn’t remember exactly what inspired her to choreograph a work with a swimming theme, but she became fascinated with the idea of extreme athleticism. Not that the 11 works in “The Arc Between” settle on humor alone. The dance department is cutting a wide swath in bringing the concert’s theme to the stage. Artistic Director Susannah Keita said the theme of the concert was spawned from a discussion she had with colleague Angel Crissman. They talked about how modern dance choreographers of the 20th century rarely turned away from the tough issues. They explored the whole arc of possibilities in between. Painting with such a wide brush has resulted in a diverse program. “‘The Arc Between’ covers so many different genres of life – everything from political things today to subconscious thoughts,” Iuliano said. “Another work is more pedestrian, where it looks as if someone has walked off the street,” Iuliano said. Artist-in-residence Kevin Godfrey-Chevalier has choreographed two pieces for the concert, which will feature 43 dancers bringing to life those 11 dances. Like all good art, “The Arc Between” features choreographed works that comment on social issues. The work likely will be particularly meaningful to the senior students at the show – 17 senior class members are featured. But Martinez said the work isn’t forlorn in any way. “It’s just showing our journey,” she said. GCU’s dance department, seen here at the 2016 winter dance concert, will perform works that feature everything from “Skirts” to a swimming theme to a jazz work inspired by the heart’s natural pacemaker for the 2017 winter concert at Ethington Theatre. 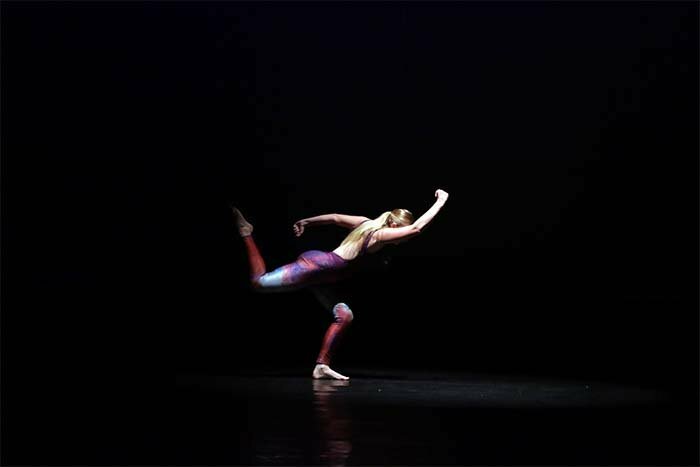 The show’s other guest choreographer, Christy McNeil Chand, an assistant professor of dance at Cal Poly in San Luis Obispo, Calif., has created a jazz work called “Sinotrial Node.” The sinoatrial node is the heart’s natural pacemaker. Keita said that as viewers watch the work, they will see a constant pulsating movement that echoes the constant beat of the heart. It’s a “stunning concert jazz work that pulsates with energy and whispers of the fragility of life,” Keita writes in the concert program. Another work, by Alicia-Lynn Nascimento Castro, is called “Skirts” and will feature an array of skirts, while Keita’s piece, “Race to Freedom,” explores the dancers’ feelings when they experience microaggressions. The concert also will feature “Three Worlds” and “Tarantella” by choreographer Scott Martin and “The Arc Between is not as Long as you Think” by Crissman. Performers will dance to music by rock bands Radiohead and Alt-J, Australian composer Ben Frost and American composer Philip Glass, to name a few. Next up at Ethington Theatre is “Major Barbara” on Feb. 9-11 and Feb. 16-18. As for the University’s dancers, once the winter concert has wrapped up, they will start preparing for the Spring Student Spotlight dance concert March 13-14 in Thunderground and the spring dance concert, “The Tipping Point,” April 13-14 at Ethington.